Product #17603 | SKU S3 SHOCK | 0.0 (no ratings yet) Thanks for your rating! The S3 Shock by Blue is a universal spider shock mount designed to hold Blue's Bottle Rocket Stage 1 and Stage 2, Kiwi, Baby Bottle, Bluebird, and Spark microphones. Not just a mount, it also helps isolate microphones from stand vibration and protects the capsule from shock. Microphones sit securely inside the threaded mount and the elastic suspension helps reduce noise from shock and vibration. The S3 Shock is hand-made and soldered from solid brass and a built-in thumbscrew lets you easily position the mic for precise placement. 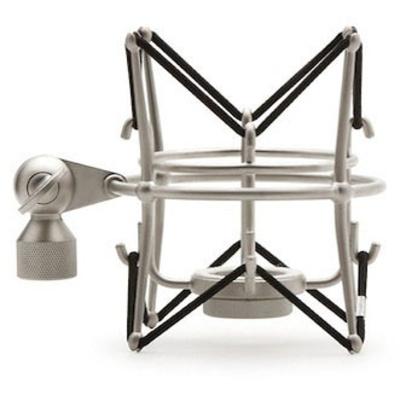 With its sleek, professional design and its indispensable functionality, this shock mount is a must-have for any studio with one of these Blue microphones.